Touch sensor as a motorcycle security is already quite sacure. However, adding an alarm is a plus for securing your motorcycle. If the motorcycle’s lock is rotated to the ON position, then if in about 6 seconds, the touch sensor is not touched yet, the alarm will be activated. For those of you who know the exact position of the sensor, a period of 6 seconds is more than enough to touch the sensor. But for a thief who certainly do not know the position of the sensor, then 6 seconds later he would be shocked because the motorcycle he just stolen suddenly honk by itself. This circuit is astable flip-flop circuit which is used to activate the relay. This RLY2 relay that will be used to honk the horn. To stop the flip-flop, we simply pull the voltage at the anode of D4 to the ground. Therefore, we connect this point to the collector of Q1 through diode D5. 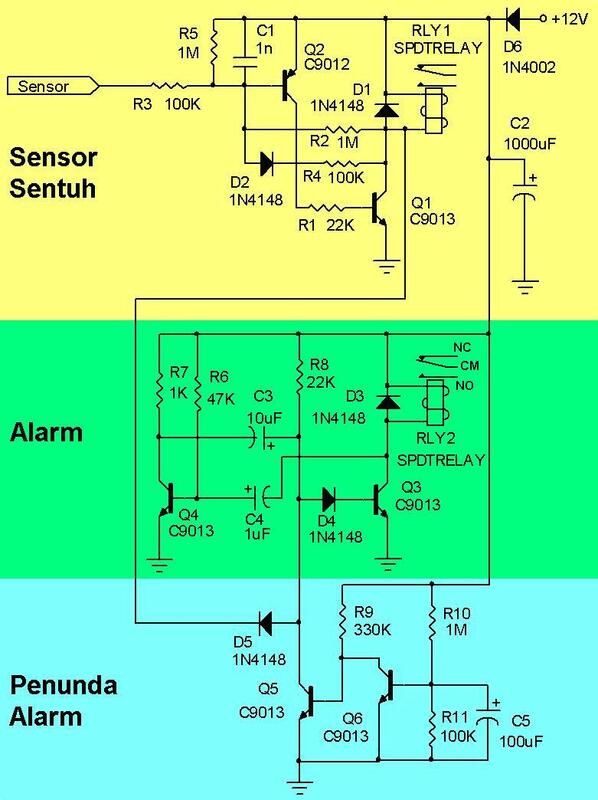 Thus, if the sensor has been touched, the alarm automatically also will stop working. This section serves to delay the alarm work. The first time the circuit got the power supply, the charge on the C5 is still empty, so the transistor Q6 is OFF. Since Q6 is OFF, then ON and Q5 it will attract D4 anode toward the ground. Thus the flip-flop will not work. Slowly C5 will be filled electrical charge through R10 until the end Q6 ON. At ON Q6, Q5 will be OFF and the flip-flop can work. C5 value determines the delay time. The larger the value, the longer the delay time. There are two types of mounting the horn button. At Honda, the horn button is used to connect the positive part of the horn, while the negative is always connected to the chassis. While on a Yamaha, horn button is used to connect the negative, while the positive part is always connected to the positive of motorcycle electricity. For Honda’s horn type, the installation is by connecting the positive part of the horn, the part that is connected to the button, to NO from RLY2, then connect the CM from RLY2 to positive electricity after the key (point B on the installation of CDI AC or CDI DC). For the type of Yamaha horn, the installation is by connecting the negative part of the horn, the part that is connected to the button, to NO from RLY2, then connect the CM from RLY2 to the chassis. However, if the motorcycle is using CDI DC, then we must move the positive cable to keep connected to point B. Remember that the installation of CDI DC, we break point B then connect it in series with the relay of touch sensors. Thus, when the sensor has not been touched, the horn will not sound. Therefore, we must move the cable plus the horn section in order to be remain connected to point B.